In our last blog post, we began talking about how home security and other home improvement projects can help you lower your insurance rates. To read more, go here. In that previous post we discussed how improving home security can be a great means to get your insurance premiums lowered and at the same time, have better security for your family. 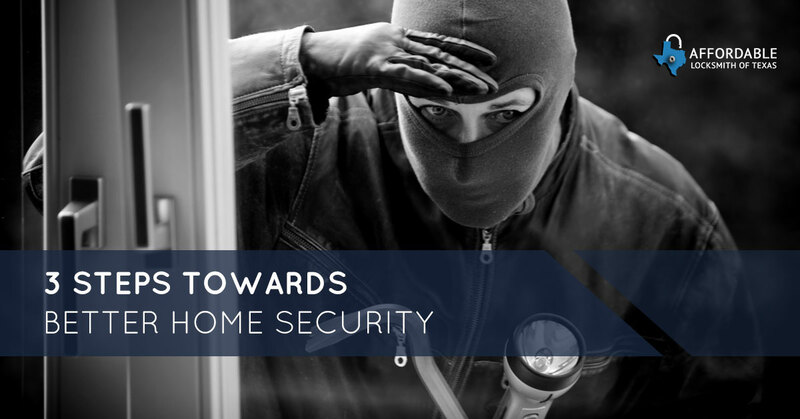 The first thought that we discussed in our last blog to begin addressing your home’s security is to think like a burglar. When you look at your home, what weaknesses do you see? Do your open windows broadcast when you aren’t home and the valuables such as electronics that you own? Does your home’s windows and doors appear to be easily broken or opened without a key? Next, we suggested that one should speak to a professional local locksmith in Spring and consult with them as to the latest and best security measures and products that they suggest to their clients in the area. Also, we suggested that residents of Spring speak to their local law enforcement for suggestions for simple ways to keep your home secure. Both can give you valuable information that could not only protect your home, but also put more money in your pocket each month. In today’s blog, we want to delve a little deeper and talk about what your local locksmith in Spring might suggest for increasing the security of your home. If you have lost a key or were not the first owner of a home, our locksmiths suggest that you get your locks rekeyed. Rekeying is a lot less expensive than replacing locks and can have just as much effect as rekeying your locks. If you have been keeping up with our blogs, you will have read about the benefits of electronic locks for your home in Spring. We will summarize here, but read the full post here. Electronic locking systems give you more control as to who has access to your home. If you have a lot of people that access your home daily, such as kids that arrive at separate times during the day, maid service, or a babysitter then having electronic keys can allow you to not only see who accessed your home, but also disable particular keys when a person no longer needs to access your home. Damaged locks or locks that have not been installed properly can also be security hazards, causing the door not to lock properly. Ways to know if your lock might need maintenance or to be replaced is if you have trouble opening or closing the door, the deadbolt doesn’t fully extend, or if your key doesn’t function properly. Though these may be signs of other maintenance required, these are tell-tale signs that your locks may need replacement or some well-needed maintenance. Have questions about your home’s security or if you need to replace your locks? Contact Affordable Locksmith of Texas! Our locksmiths are licensed, knowledgeable and experienced, and ready to help the residents of Spring have the best security. Contact us today! New clients receive 10 percent off their first service! Locked out? No problem! Just contact us! One of our locksmiths will contact you in 15 minutes!